The real estate development and construction management firm announces a second grant obtained for the tribe from the U.S. Department of Energy. 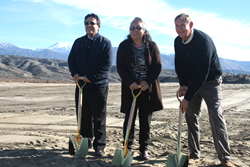 Optimum Group President Ali Sahabi, Tribal Chairwoman Rosemary Morillo and Coldwell Solar Representative Kevin Webb break ground on the historic solar power project. Optimum Group LLC has secured a second Department of Energy grant for the Soboba Band of Luisen͂o Indians, bringing the total in federal funding for the tribe’s solar energy project so far to $1.5 million, officials announced today. The latest award of $500,000 was a facilities grant confirmed in March through the Department of Energy. An earlier $1 million community grant through the DOE was awarded last year. Both grants were conferred in association with a 1 MW facility being built in the eastern part of the reservation, the first of two solar power arrays planned by the tribe. It will power the administrative center, schools and other community buildings. “Solar power is of huge importance to Soboba as we move closer to becoming a self-sustaining tribe,” said Tribal Council Chairwoman Rosemary Morillo. Optimum Group LLC has managed the entire process as the solar project developer and owner’s representative. That work included planning and engineering, applications, securing the two grants from the U.S. Department of Energy and finalizing an aggregate net-energy metering agreement with Southern California Edison following Rule 21 of the California Public Utility Commission. Optimum Group provides innovative real estate development and construction management services to government agencies, public and private companies as well as nonprofit organizations. Decades of experience provides comprehensive oversight for a wide variety of projects with intense attention to detail. Our highly qualified team of professionals has successfully planned, designed and built bridges, industrial buildings, high-rises, colleges, hospitals, notable mixed-use developments and award-winning green communities. Visit http://www.optimumgroupllc.com.